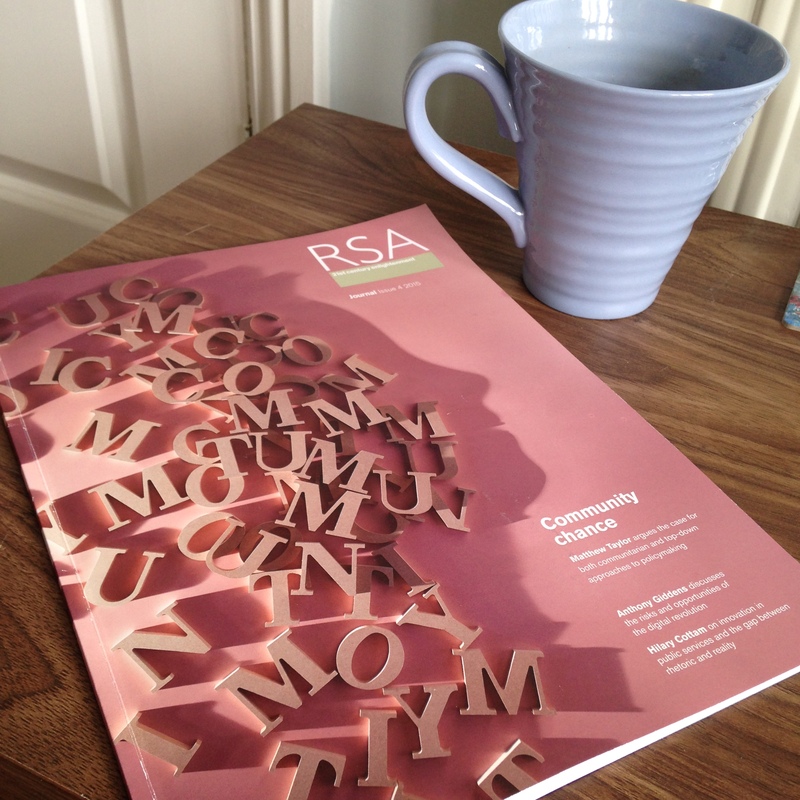 While settling down with a nice cup of fresh coffee this morning I picked up my copy of the latest RSA Journal. The focus of this issue is communities, and asks: how can more communities play a bigger part in making change happen? I quickly got drawn into a great article about charities by the outgoing Chief Executive of Save the Children, Justin Forsyth. You can also read the article here. Over my working life I have worked as both a campaigner targeting the government from the outside and inside government, where I have been on the receiving end of campaigns. For the past five years I have been back on the outside as chief executive of Save the Children. I am often asked what I have learnt as I’ve switched ‘sides’. The answer is simple: there are no sides. Or, more precisely, the two sides are not inside and outside, but people in both camps who are either restless for change or people who find comfort in the status quo. And I am clear – effective charity leaders must be unambiguously, relentlessly, ferociously of the former. Given the scale of our ambitions for social justice, the nature of shifting power dynamics driven by everything from the digital revolution to the rise of the emerging economies, and the degree of scrutiny that all institutions – from banking and politics to the media and charities – now come under, we simply do not have the luxury of standing still. Justin then goes on to outline five lessons he has learned over the last five years at Save the Children. Here is an overview of them. The first lesson is that it is more important to build a shared platform than to build one organisation. The second lesson is that it is more powerful to recruit unexpected allies than to galvanise the usual suspects. The third lesson is that it is as important to build an exceptional team as an exceptional idea. The final and, in many ways, the most important lesson is that who you are should determine what you do, not the other way around. Whether you lead a charity, a community group, a social enterprise, or are simply getting up to something for the good of others, do any of these resonate with you? I’m really keen for CoLab Dudley to be a shared platform, and hope to have support through Dudley CVS to start some really exciting things with CoLab this year. I’m not sure I have much experience of recruiting unexpected allies, though on reflection I am surprised how much I’ve grown my networks in the last few years beyond the usual suspects in the community development field. As a result I have hugely increased my repertoire of tools and tactics to support change in communities, which in turn impacts on my ability to influence decision makers. I’ll stop there with the sharing of my reflections, as I’d love to hear some of yours. I’d also love to hear perspectives on where we’re at in Dudley borough. Do you think we have charities which are restless for change, or which find comfort in the status quo? Who should we look to learn from in our sector? And where are the teams restless for change in our local public sector that we can work with on issues of social justice? Maybe we could interview people from some of them for this blog or The Echo.